*** ASSASSIN'S CREED IDENTITY is the first Assassin's Creed action RPG game for iPad and iPhone that lets you create, develop and customize your own Assassins and play as them in one of the greatest classic Assassin's Creed eras: the Italian Renaissance. - Become an assassin and experience the freedom of movement for which the Assassin's Creed franchise is so famous - for the 1st time ever on your phone or tablet! Controls support simple tap-to-move and dual virtual stick controls. - Short and varied game sessions designed to be played on the go. - Randomly generated missions, created around 16 different mission types, allow for a virtually unlimited lifespan and ensure you never have to play the same missions twice. - Unravel the mysteries of Assassin's Creed Identity as you play story missions in the Coliseum, Florence and other famous locations of the Italian Renaissance. - Unlock new locations and items by playing through the game. - Learn the history of monuments, characters or events that you come across by reading the extensive Codex. - Choose between 3 unique classes, each with their own strengths and weaknesses, and find the one that fits your play style best. Experiment and play in open sandbox levels. - Customize your own Assassins by using your loot and choosing from unique outfits and color variations. - Use the decryption system to create the best among tens of thousands of items. - Hire friends and other players as Assassins to help you complete your objectives. Call them at any time during mission to get them to come to your help. - Train, develop and equip 2 different Assassins. 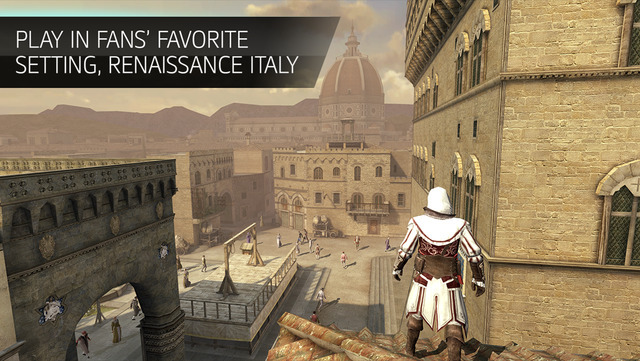 - Discover the Italian Renaissance - the favorite era among Assassin's Creed fans - recreated in full 3D open maps. - A new milestone in mobile graphics with the latest Unity engine and custom-made HD textures, shaders, and models, as based on the Assassin's Creed console games. - The game features a dynamic crowd system, night/day/weather presets and dynamic lighting, which bring the different locations to life like you've never seen before on the mobile platform. Assassin’s Creed Identity is free to play, you can choose to pay real money for some in game items which will charge your iTunes account. You can disable in-app purchases by adjusting your device settings. We’re really sorry, but Assassin’s Creed Identity doesn’t work properly on iPod 5, iPad 2 and lower and iPhone 4S and lower. We tried very hard to accommodate these devices, but we weren’t able to create the experience we want you to have for now. Join Assassin's Creed Identity community! Из приятного: Графика. Не ожидал что на 5 айфоне будут тени в реальном времени при такой отличной детализации и открытом мире, ведь видел на 4пда, что на 4 айпаде теней нет. Ага, понял. Убил противника просто тапнув по нему) Бои стремные и снова скажу, убогие. Разбавляет убогость какое-то колесико скиллов, может потом будет нечто поинтереснее. Никаких настроек управления нет. Строимся все под одну линейку. Добавьте сюда тупые задания, ноль сюжета и донат, который всегда будет мешать спокойно насладится игрой и можно с уверенностью сказать: 1.5 из 5.